(C trumpet, Cello and Piano). Mark Boren, trumpet; Julianne Boren, cello; and Ellen Bottorf, piano. Audio clip performed by The Orenunn Trio. Recorded by Trio Chromos: Ismael Betancor, trumpet; Carlos Rivero, cello and José Luis Castillo, piano. Audio clip of Elegy performed by Trio Chromos: Ismael Betancor, trumpet; Carlos Rivero, cello and José Luis Castillo, piano. 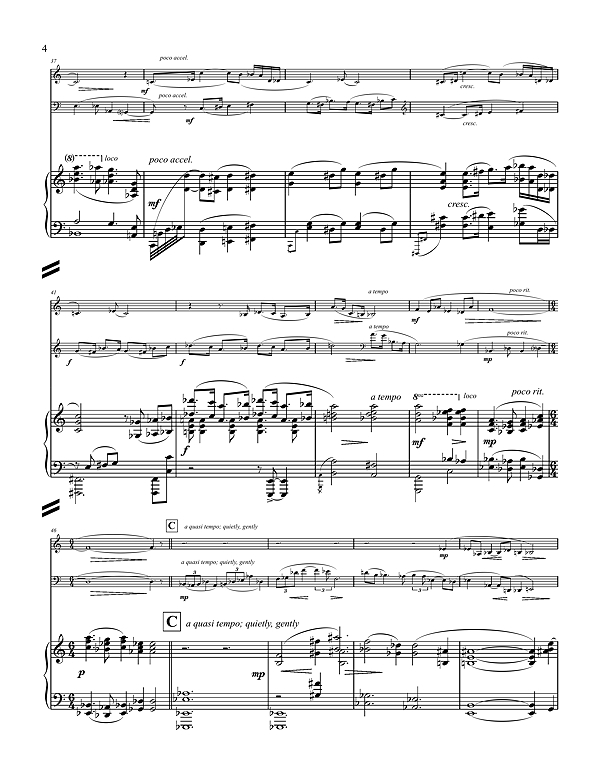 Audio clip of Elegiac performed by Sue Collado, clarinet, Sasha von Dassow, cello, and Elizabeth Schaltenbrand, piano. 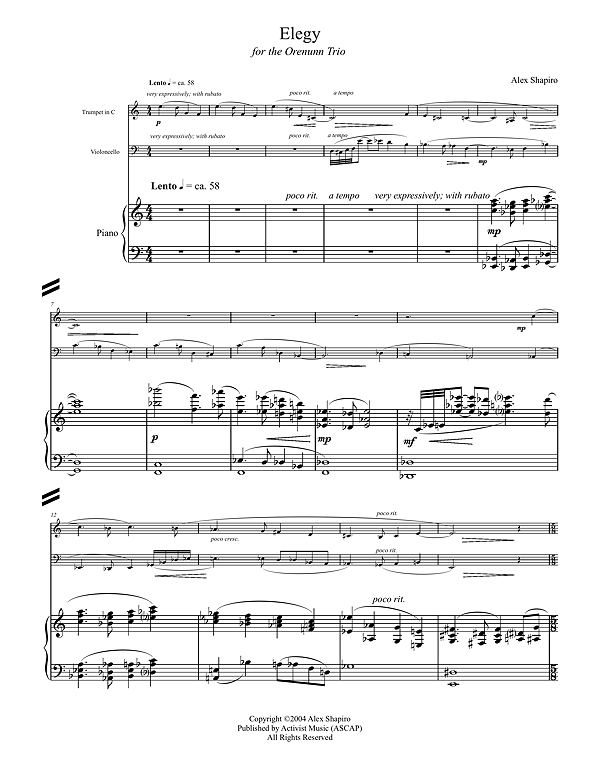 Score and parts available from Activist Music for $30.00 print; $21.00 digital. Elegy is featured on the Trio Chromos 2007 CD, Trumpet Colors, on Crystal Records 766. Click CD for more info. "... The melancholy falling theme of Alex Shapiro’s Elegy hints a little at Brahms. The plangent cello line is seconded by the trumpet and supported by the supple piano, which then picks up the mood and all three instruments conjoin in lyric reflection. It was written originally for the standard piano trio of violin, cello and piano... Enjoyable and never trivial... excellently realised by the trio – fine sound as well completes the pleasure." "...the Trio Chromos (Ismael Betancor, trumpet; José Luis Castillo, piano; Carlos Rivero, cello) plays with utter abandon in these works, fully convinced of their authenticity and importance, and with all of the requisite skill and stylistic manners needed to successfully convey the music’s spirit." Dedicated to my late father, Ivan Shapiro. One movement work. 8 pages, 8.5" x 11". Premiered on April 2, 2000 in Bakersfield, CA. (Bb Clarinet, Cello and Piano). Premiered on June 26, 2010 in Friday Harbor, WA by Chamber Music San Juans: Patricia Kostek, clarinet, Doug Davis, cello, and Arthur Rowe, piano.